For the past four July 27ths I have made Dan (whose birthday is today – Happy Birthday!) 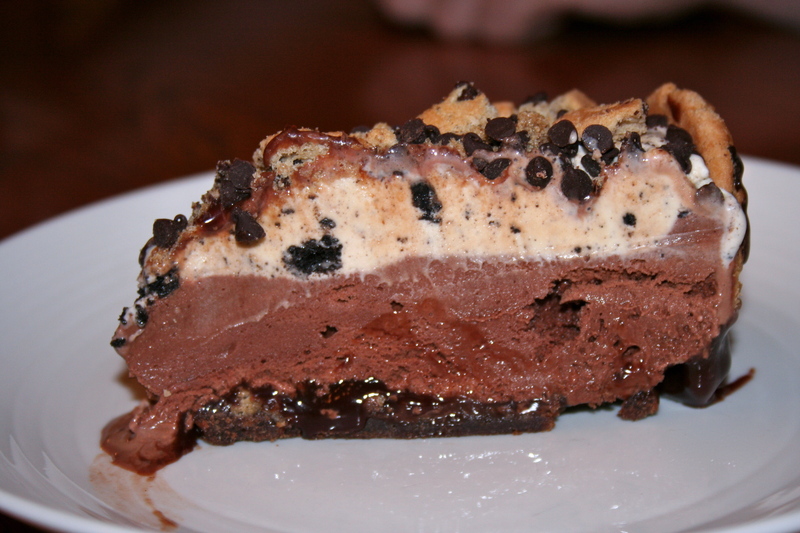 this ice cream cake. Four years ago I asked him what type of cake he wanted me to make for him, and somehow the conversation got around to ice cream cakes. He had never even tried an ice cream cake before (!!! ), so I did some Google-ing and found this recipe. After making some adjustments and leaving out some ingredients, it was perfect. It was definitely a risk making it for the first time for a special occasion, but this cake is one of the most delicious things I’ve ever made! While it’s not exactly labor-intensive, it sure does taste like it, and it looks really great, too. Give it a go for your next summer party! 2. Set aside 20 cookies. In a food processor, combine the remaining cookies with the melted margarine. Spray the bottom of a 9-inch springform pan, then press the cookie mixture onto the bottom. Bake for about 8 minutes, or until you can smell the chocolate. 4. Microwave about 1/2 cup of the fudge topping for a few seconds, and pour over the cookie base. Freeze for 15 minutes, or until completely set. 5. While the base is freezing, take out your two ice cream flavors and allow them to soften for a while. 6. Once the hot fudge has set, spread your first layer of ice cream on the top. Freeze for about 15 minutes. 7. Once the first layer has set up a bit, spread out the second layer of ice cream. 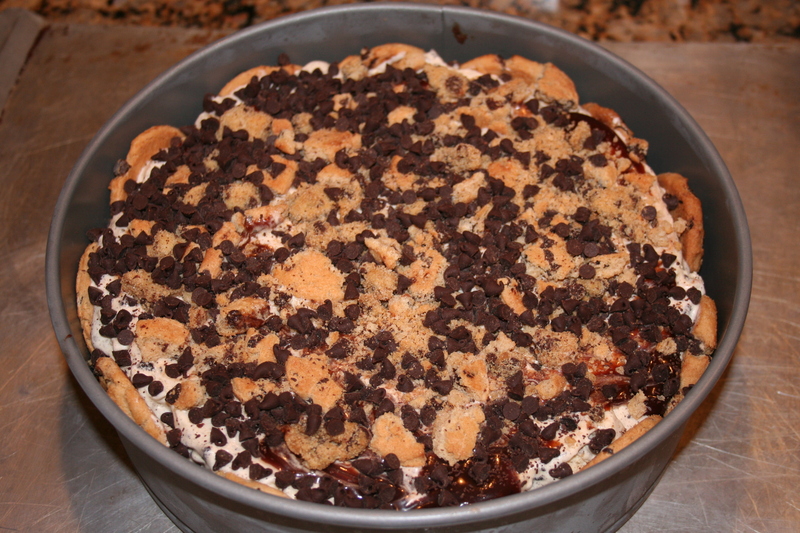 Top with a 1/4 cup drizzle of heated-up hot fudge, crumbled cookies, and mini chocolate chips. 8. Freeze for at least 4 hours. The easiest way to cut this cake is in sections (one cookie per section) and with a knife that you’ve run under hot water (it cuts through the ice cream much easier!). – I use Chips Ahoy! cookies when I make this recipe. If you can’t find that brand or your store doesn’t have it (I’m thinking they don’t ship it too far out of the U.S.), use a chocolate chip cookie that is not too soft and one that is about 2 1/2 – 3 inches in diameter. – The original recipe does not require you to bake the crust. I don’t know why I do, exactly; I just did it the first year for some reason, and it turned out well, so why change my methods? If you don’t feel like baking it, don’t worry about it! – Make sure you use hot fudge sauce, and NOT chocolate sauce or syrup. Hot fudge sets up differently than chocolate sauce or syrup does, which is key. – Obviously you can use any ice cream flavor you want – I would recommend flavors that contain chocolate, coffee, or vanilla, but something like strawberry might be an interesting choice! – If your freezer space will allow, I recommend putting a small sheet tray underneath the cake while it freezes: sometimes melty ice cream will drip out, so you could just save yourself the clean up ahead of time! 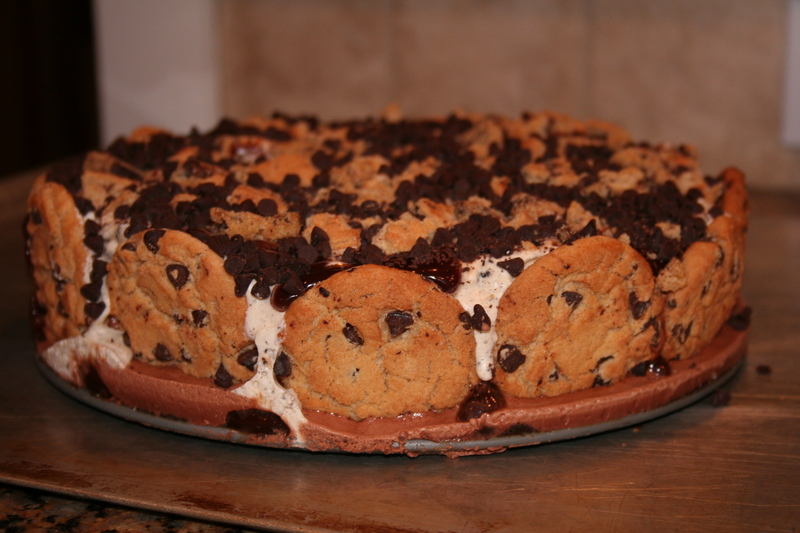 – I chose to top the cake with hot fudge, crushed cookies, and chocolate chips, but experiment with what you like! The original recipe calls for whipped cream and cherries, which would be good too, or you could drizzle on caramel sauce, throw on some butterscotch chips or fresh berries…. – Again, this recipe isn’t difficult, but does take some time. I’d give yourself at least 6 hours before the occasion to get this made! – Let me know if you experiment at all with the flavors and toppings!